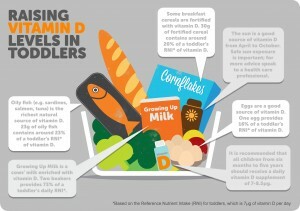 Expat Family Health » Do you know how much vitamin D your toddler needs? Do you know how much vitamin D your toddler needs? Toddlers in countries with few hours of sunshine run the risk of not getting enough vitamin D.
Vitamin D, used for the development of strong bones and teeth, is essential for healthy toddlers, but does yours get enough? The main source of vitamin D is sunlight, but for countries more prone to grey skies, experts say sunlight isn’t enough. New survey results from the toddler health website, growingupmilkinfo.com, highlight that the majority (91%) of UK mums don’t know the recommended daily intake of vitamin D for toddlers. The website is working with TV regular Dr Chris Steele to promote Vitamin D Day (31st March). The aim of the campaign is to address misconceptions and educate parents on the role diet plays in getting vitamin D into children. Aside from sunlight, there are several dietary sources of vitamin D to help you ensure your toddlers get their recommended 7µg per day. Oily fish, liver and eggs are natural sources, as well as fortified breakfast cereals and milk. Vitamin D Day will address the need for parents to top-up their children’s vitamin D, especially in countries where sunlight is lacking. She went on say toddlers living north of Birmingham in the UK have recorded lower levels of the vitamin than their more southern counterparts.